Good morning! It's been grilling season for awhile here now, so I figured it's about time I shared my new favorite marinade for grilled chicken. I've never been too big a marinade fan, but this recipe from The Naptime Chef sounded so fresh and easy that I had to try it. It's quickly become my go-to recipe when I want to grill chicken. (Move over bbq sauce!) I've basically halved the ingredients from the original recipe . With lemons sometimes being quite pricey most of the year, not to mention the cost of good olive oil, I'm pleased to report that the result is still very flavorful. I've only made this recipe with chicken breasts, but you could use any cut of chicken (thigh meat on kabobs would be great), pork or fish. As you can see from the picture, I don't mind the texture of rosemary, but leave the needles on the sprig so you can remove it at the end or chop them up finely if you do. Whisk together lemon juice, olive oil, salt, pepper, and cinnamon. In a gallon sized bag, pour marinade over chicken and add garlic cloves, rosemary (on or off the sprig), and lemon halves. Turn to coat well. Place in refrigerator for at least 30 minutes but ideally an hour. The acidity in the lemon juice will eventually "cook" the chicken so you don't want to leave it too long, but the original poster states that she's let it rest for 5 hours with great results. Preheat grill to medium heat. Discard rosemary sprigs and lemon rinds. 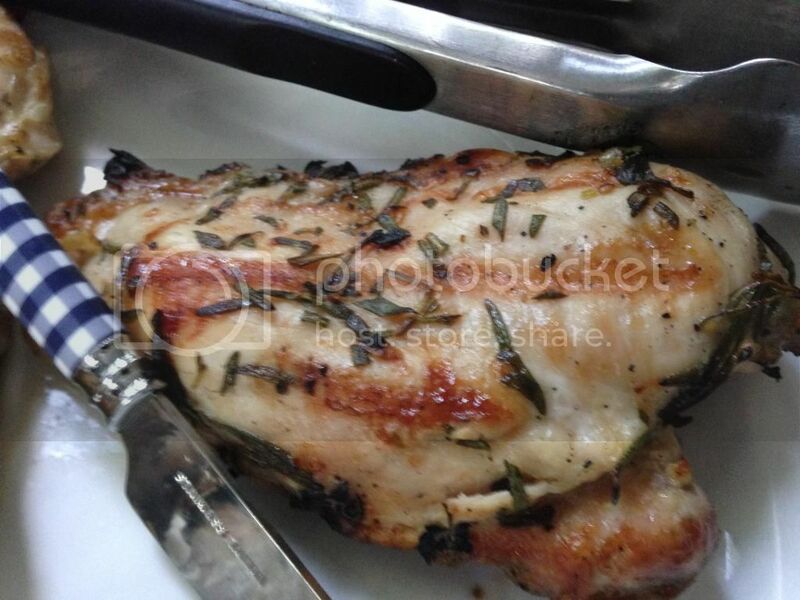 Grill chicken 5-7 minutes per side, until cooked through (165 degrees F).